Whether you’re an itsy bitsy baby Overwatch player or that Junkrat who keeps using his exploding tire to hunt me and only me (I WILL FIND YOUR HOME), you’ll fare about the same against a room plastered with death lasers: poorly. Popular Team Fortress 2 YouTuber Muselk has been branching out into Overwatch’s beta recently, and he’s brought his penchant for inventive strategies with him. Case in point: The Kill Room. The idea is remarkably simple, to the point that Blizzard should probably do a balance pass on this one. 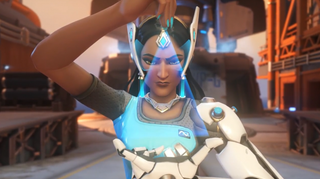 Reality bending Dragon Ball Z scouter enthusiast Symmetra can stick tiny laser turrets on any surface she pleases. Muselk’s idea? Instead of spreading them out and wearing opponents thin, cram every possible laser sentry—not much of a threat at all individually—into a single compact room. Then lure people in and begin cackling maniacally. The result? Hilarious carnage. Only the tank-iest of characters could make it through, albeit significantly worse for the wear. Everybody else got zapped to smithereens within 1-2 seconds of entering. It also worked pretty well in tight hallways and well-concealed archways. I’m sure this is, to an extent, a strategy Blizzard expected people to attempt. I mean, look, we’ve all fantasized about being a James Bond villain at some point or another; tens of cleverly arrayed laser sentries and a little cunning can go a long way. Like moths to a flame. Good, GOOOOOD. But I’m not sure it should have the potential to be this devastating, especially with some Overwatch maps being centered around a series of clear choke points. That said, the laser-ees in this situation do have themselves partially to blame. As Muselk points out in the video, there were routes around the rooms he picked. People could’ve flanked him and his partner in LASERCRIME. Sometimes, though, when faced with impossible odds, human beings find it in their very souls to transform into heroes. Sorry, not heroes. Idiots. I meant idiots. We see a challenge, a goal, or in this case, an enemy-shaped light at the end of the laser tunnel and shout, “CHARRRRRRRRRGE.” Typically, this decision-making process, if it could even be called a process, does not end well. You know, on second thought, maybe this Overwatch strategy is an example of everything working as intended after all.